Retirement is never too far away to begin planning for it. Planning for retirement sooner rather than later will certainly put you at an advantage. If you want financial security in your old age, you have to start working on it now no matter if you would like to or not. Commitment is a critical trait in planning for your retirement. Only a handful of people know how much savings they need to set aside in order to have a comfortable and stable life after they stop working. Your retirement years should be spent without financial worries since you have worked all these years to obtain financial security. Unfortunately, this does not always happen as many people fail to formulate a plan or stick to their retirement goals. If you have already put some money away, you should keep adding to it until you have reached your goals. It does not matter if you are saving for your retirement or if you are saving for a grand family vacation. There are benefits to making saving a habit, and you will soon realize that to be able to sustain a comfortable retirement, you need to have enough savings. .
Life expectancy has grown, and you have to try and foresee a future where you have to live on a fixed income for a long time, possibly 30 years or more. You need to face the fact that retirement needs money. 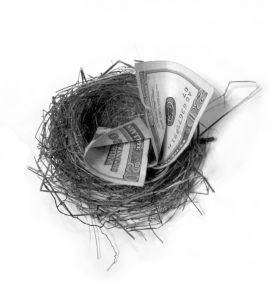 According to experts, you should aim to be able build a nest egg that helps produce at least 80% of your pre-retirement paycheck in order to continue living the same lifestyle you are accustom to during your retirement years. Your financial future is in your hands, and planning is your best ally. If retirement savings and financial planning are offered by your employer, you should consider taking advantage of these plans. One thing that I love about employee retirement plans, such as employer sponsored 401-k plans, are that they often include mandatory deduction from your paycheck which make it easier for you to continue making a timely contribution every month. Learn as much as you can about your employers retirement plan. Many plans and planners that you can use through your company can help you understand how much your contribution should be, how to maximize your contribution, and how long you need to contribute to your retirement in order to have enough money to retire on. If you have started saving for your retirement, consider not touching that retirement the money for any reason other than retirement. If you are going to withdraw it, not only will you ruin your plans but you will also lose a lot of future earnings from that money. Talk to a financial adviser or your Human Resources department to find the best retirement investments for you. It is possible to make your retired years pleasurable if you manage your finances properly now and put away enough money in order to maintain your current standard of living. Saving for retirement is stupid! Instead what we should all be saving for is financial independence. If you think about it, in order to retire you must first be financially independent. And you need to be clear about how you define the word “retirement” or the argument is moot. True retirement is when you support yourself 100% with passive income. If you are “retired” but working part-time, you are not retired — what you are, in that case, is working part-time. That is why most people never really “retire” early — too expensive. Instead, what they do is finance a change in the construct by which they produe earned income and add some passive income to the mix. What that means in the real world is that they ditch the nine-to-five routine for some other routine (work-at-home, part-time job, consulting, etc.) and cover the difference (shortfall) between their earned income and costs-of-living (monthly nut) with income from savings (or the savings, themselves). “Retire” is something people of a certain age do and it holds hardly no allure for young people. Financial independence, on the other hand, is something all of us find alluring! Great message! Everyone needs a retirement strategy that includes an estimate of retirement needs. Then start saving NOW to take advantage of the benefits of compounding, company matches, dollar cost averaging and all the other greatness of long-term investing. Thanks for the awesome post, Hank. @tmgbooks: I take the message of the article to mean either official-age retirement or early/super-early “retirement” (or financial independence). The problem w/ putting everything into government-regulated retirement vehicles is that if you plan to become financially independent early, then you have to deal with red tape and penalties to take your money out. I wish I had started saving for retirement sooner. It’s funny because I remember reading articles about young college grads thinking “I’ll do it later; that’s for old people” and thinking that was such a dumb approach. Yet I inadvertently did the same thing – until this year (age 28), I had no real retirement goals or plans in place. I kick myself for missing years that could have been spent saving. I’m saving for financial independence as opposed to retirement. I may retire early, I may not. Just depends how the whole job thing goes. So far, it goes well. In my opinion, thanks to the government retirement savings are far too complicated, with far too many poor savings vehicles. Consider, we have social security which is on a perpetual path to insolvency. We have pensions – except that no one actually has to fund them so when it comes time for people to start needing the money, they collapse. We have 401k’s which are nothing but a guaranteed income stream, via excessive fees, for companies like Vanguard and Fidelity. Then we have IRAs which are probably the best of the lot. And that’s still not enough complexity, so let’s start adding in traditional and Roth flavored investments. I have dispensed with all of this. I aggressively save my net income and invest it in solid dividend paying companies. Every year I pull in more passive income than the last. Eventually, that income will be able to cover all my expenses. And if I keep saving beyond that, then I get bonus income to fund an even better retirement. All the other stuff above I consider to be gravy. “Saving for retirement is stupid!